Betty Rubble: "Barney, do you have to do everything Fred does?" Our Flintstones Betty Rubble Womens Costume includes a light powder blue coloured polyester microfleece dress with elasticated waistline. Dress is held up by a black strip of fabric that slings around the neck. There is a central 'rock' feature at the point where it meets the dress for that ultimate Betty Rubble stoneage look. Also has elastic around the top of the dress to help hold it in position. Bottom of dress has a zig zag cut for the true Flintstones style. Headpiece is foam and shaped like Betty Rubbles hair and comes with her trademark bow. It is held in place using an elastic band that is attached at the back. 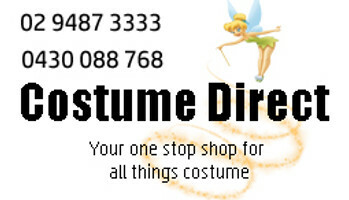 A simple, easy to wear costume. Available in Standard and Large.